Published: May 23, 2015 to ? Rin, a girl camping by herself at the base of Mt. Fuji. Nadeshiko, a girl who came to see Mt. Fuji on her bicycle. The scenery the two witness over a supper of cup ramen marks the start of a new friendship and many adventures to come, camping in the great outdoors! 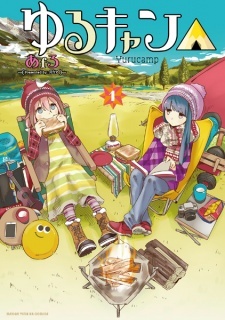 Yuru Camp△ has been published in English as Laid-Back Camp by Yen Press since March 27, 2018. Ok I'm not really experienced with CGDCT, but because it's about camping I mainly came to see the beautiful scenery of Japan's mountains and night sky. There are some funny scenes too, which adds to the enjoyment of reading this manga. We also get to know about camping, like what you need and things like that. This manga actually convinced me of going camping. Also, we get to know some interesting facts about Japan's geography, and of course their beauty too. The art is alright, but not the best in my opinion. I hope the anime adaptation does better on that. Overall, I'd give this an 8. Thanks for reading my review. It´s basically a story about cute girls going camping, building friendship etc. The art is nice (according to me nicer than in the anime), there are a lot of funny moments and since its short, you can easily read in all at once. What was lacking was some kind of character development, but since the story is about girl finding new friends I guess this was achieved; but don´t expect anything more. And interesting fact: I´ve read this manga on manganelo.com. I don´t know about other pages, but the version on this side has always 1-2 pages extra from the translator, where are very putative info and photos about the localities, onsens, camping sites etc mentioned in the story. That was definitely interesting! It is a recommended manga to spend time and laugh at some things that the characters do. what most stands out, in my opinion, is the art that is wonderful to see how the author draws the landscapes with such simplicity, but at the same time detailed, in addition to that, it is good to make designs of characters and with that "moe” style you can easily get love to the main characters. The story is simple, but enough to get hooked for a long time and see how some of the protagonists learn little by little how to campaign. Although the least remarkable is the development of the characters, which is null, well, as far as I have come (chapter 8). It is an enjoyable manga if you came with the purpose of just wanting to spend time without any expectation to the series, and also learn about camping.